For new graduate students at the J-School, there’s no better place than Butte and the Clark Fork river to experience the contrast between Montana’s natural beauty and the toll of natural resource extraction. The new group took a day to explore the Butte Silverbow Superfund Site. 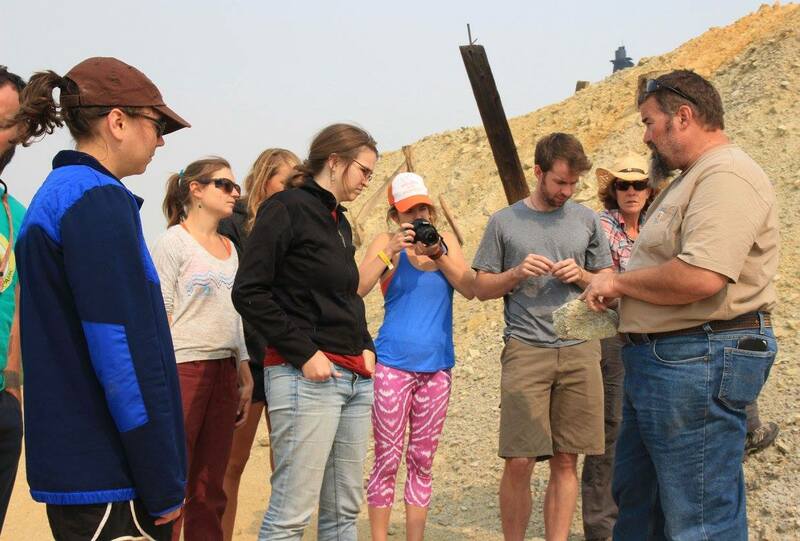 Led by Professor Nadia White, the trip began with a look at the former open air mine the Berkeley Pit, and then followed a story of mining degradation and subsequent environmental restoration all the way back to Missoula. “The whole point of this tour is that all over Montana the landscape has remarkable stories to tell,” Professor Nadia White, the trip’s author, said. “The Butte-Silverbow Superfund site happens to wear them close to the surface.” Deemed the largest complex of environmental clean-up sites in the U.S., the site is a massive effort to restore health to the Clark Fork River. For these students, entering the Environmental Science and Natural Resource Journalism Masters Program, it’s a chance to learn about a home that is new to many of them. For the next two years, they’ll cross almost daily over the Clark Fork River, which runs through the heart of Missoula. For Madison Dapcevich, 25, the tour was a chance to learn something new about Montana. She was largely unfamiliar with the story, and it left her with a question valuable to any budding journalist: “To what extent do people know about this?” Dapcevich came to the program most recently from Washington, D.C., where she worked for the media advocacy non-profit Internews, while also interning on Capitol Hill. After Butte, the group stopped in Anaconda to view the old smelter tower; at a ranch where they saw restoration of the river’s flood plain in action, and at the Milltown Overlook, where a dam built in 1906 and removed in 2008 once held back the Clark Fork and the mine waste it carried. As with any good story, White provided characters as well as settings. Students met restoration engineer Tom Molloy, a Butte resident and reclamation engineer, and Maggie Schmidt, a University of Montana graduate and manager of the Dry Cottonwood Creek Ranch. Benjamin Polley, 37, has been living, working and writing in Montana for a long time. His latest job was as a field assistant on a ranch dedicated to conservation. He particularly enjoyed their time with Molloy. “That guy’s just an awesome story teller,” Polley said. The experience left him with new questions about the state and about ecological restoration, he said.